I just started my free one month membership to Thrive Market. Before I do anything (even if it’s free for a month) I look around for blog posts and reviews about the service. I read some good reviews and some bad ones. Most of the bad ones complained about having to wait for the shipment to arrive and having to pay shipping costs. Others received damaged products, and still others had trouble with canceling their memberships after the free month. So, here’s my review of my first experience with Thrive Market. 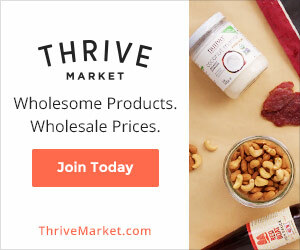 The Thrive website is chock full of sustainable, organic, healthy, recycled, gluten-free, vegan, non-toxic, mindful products I can’t get where I live. I created a 50-item wishlist on my first visit to the site. Everything on the site is discounted from the manufacturer’s list price. I care about saving money as long as I can get what I want. I don’t buy things just because they’re cheap (Walmart). Then I waited a couple of weeks before ordering anything. Eventually, Thrive sent me a coupon code for $15 off my first order, and I combined that with a coconut oil giveaway (which they do for first-time customers). 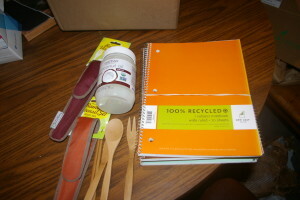 As you can see from the photo, I ordered simple things to start: bamboo flatware my husband and I can take hiking, five (FIVE) 100 percent recycled notebooks to give to my new Young Living members, and the coconut oil. I paid $8.80 INCLUDING shipping and handling. I ordered on a Sunday night and the package arrived the next Saturday, and the order was shipped within one business day. So then I wondered if Amazon Prime was everything the people who were complaining about Thrive Market said it is. I’m not an Amazon Prime member, so your prices/experience might be different. The 15-ounce Nutiva coconut oil is listed at $8.81 on Amazon. The bamboo flatware is listed at $12.95 each, and the notebook is listed at $6.79 EACH (that means for one notebook). The notebooks aren’t available for Prime shipping. By my math, I’d have paid Amazon $68.66 for the privilege of free 2-day shipping. Meh, I can wait if it means I save $59.86. Now, keep in mind that Thrive Market is a membership site, and this costs $59.95 for a full year. So I’m still 9 cents short on the savings over Amazon Prime. But Thrive Market gifts a membership to a low-income family when I join, so I’m helping one family somewhere get access to healthy food and supplements and household products. And they have a whole bunch of good missions and values that I like to support. So that makes me feel good. Plus I have a 15 percent off coupon code and a $25 off coupon code just waiting for me to not spend an outrageous amount on my next order. That sounds like a pretty darn good deal. The items arrived in great condition and were exactly as I expected them to be. No complaints about Thrive Market from me. Well, OK, I have one complaint. They send a lot of emails. What are your experiences with them?